Set up shop right next to the ballpark formerly known as the "Cell" with your very own South Side joint. 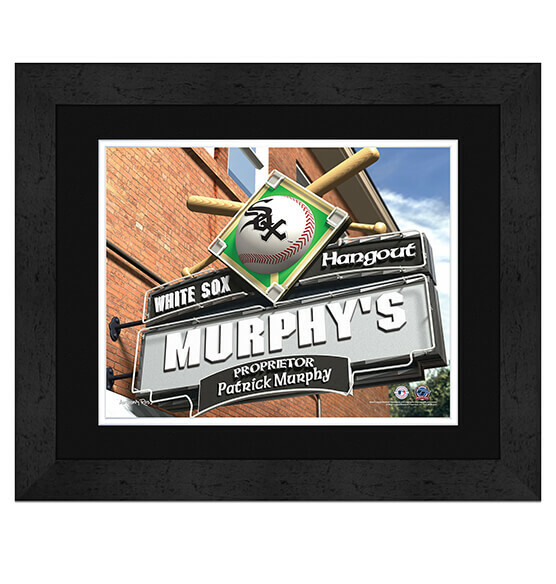 This officially licensed Chicago White Sox Personalized MLB Pub Sign Framed Wall Art decor will be a gift any White Sox fan will go completely gaga over — especially if the fan has an affinity for suds. Perfect for any ChiSox fan zone, this fully customizable personalized pub sign lets you be the proprietor of the most popular ChiSox hangout in Mud City. With its vibrant team colors, team logo and sleek black frame, this piece will look great anywhere. It arrives ready to hang with a convenient sawtooth hanger for easy mounting.